Wild adventures begin with membership! Join or renew today, visit today — Just Zoo It! It’s the best family entertainment value around. Enjoy free daytime admission to the Zoo and Garden every day for an entire year, guest passes, discounts and a whole lot more. Plus, becoming a Riverbanks member is a simple action you can take that will have a lasting impact on conservation. No matter how or where you join, your membership card will be available at the ticket booth on your next visit to the Zoo. All of your membership information, benefits and guest passes are stored on a barcoded membership card, which is yours, permanently. Simply join or renew online, at the gate or in the mail, and your permanent membership card will be activated—or reactivated—on your next trip to the Zoo. Then, just show your card at the turnstile each time you visit for a speedy entry experience! Primary Benefits for all membership levels. Free “green” guest passes (each guest pass is a $16.95 value). Free visit to Lights Before Christmas. Free subscription to Riverbanks magazine. Free admission to Members’ Night Out. Discounted admission to more than 100 participating zoos and aquariums across the country. Learn more about reciprocal admission privileges. Members-only discounts off Boo at the Zoo and other after-hours events. 10% discount in Zoo and Garden gift shops. Timely and informative email updates. Discounts off Riverbanks Backstage tours and Zoo Camps. 20% OFF Entire Regularly-Priced Mast Store Branded Purchase. Cannot be combined with other offers or to purchase gift cards. Not valid on Mast Store employee purchases. Limit one offer per visit. In-stock items only. Not valid online. Valid Riverbanks Membership Card required to receive offer. Offer valid thru 12/31/2019. Choose a Membership Level that fits you best! One free visit to Lights Before Christmas. Children ages 18 and under living in household OR Grandchildren ages 18 and under. Unlimited free visits to Lights Before Christmas. 25% discount on facility rentals. Two complimentary tickets to Wine Tasting at Riverbanks Botanical Garden. Two complimentary tickets to Brew at the Zoo. Two complimentary tickets to Riverbanks ZOOfari. Consider the Savings with the best family entertainment value around! Compare and see for yourself. Individual Membership—a greater than $130.70 value for only $59.00! If 1 adult visits the Zoo twice at the cost of regular admission, it costs $40.90. If 1 adult visits the Lights Before Christmas once, it costs $12.00. The 4 free guest passes included in this membership have a value of $79.80. Plus, as a member, you save $2 off tickets to the Sky-High Safari vertical ropes challenge and up to $20 off each Zipline Canopy Tour ticket! Family Membership—a greater than $311.30 value for only $115.00! If 2 adults and 2 children visit twice at the cost of regular admission, it costs $147.60. If 2 adults and 2 children visit the Lights Before Christmas once, it costs $44.00. The 6 free guest passes included in this membership have a value of $119.70. BEST VALUE! Family Explorer Membership—a greater than $635.00 value for only $199.00! If 2 adults and 2 children purchase daily rides and attractions wristbands in two visits, it costs $160. If 2 adults and 2 children visit the Lights Before Christmas twice, it costs $88.00. The 12 free guest passes included in this membership have a value of $239.40. Plus, as a member, you save $4 off tickets to the Sky-High Safari vertical ropes challenge and up to $20 off each Zipline Canopy Tour ticket! Visit more and do more—you’ll save even more! Riverbanks members can stroll through the Zoo on two Friday evenings for two extraordinary hours—when the park is normally closed to the public. Come one evening or both. Join us May 24 and June 21. Gates open at 6:00pm. Parking at the main Zoo entrance only. Valid membership card and ID required. 20% off retail purchases - Spend $30, get a reusable straw or tote bag! Reciprocal Admission Privileges for more than 100 participating zoos and aquariums nationwide. 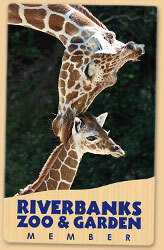 Riverbanks members are entitled to discounted admission into more than 100 participating zoos and aquariums nationwide. Reciprocity applies only for admission to the main facility on normal operating days/hours and may exclude exhibits or events requiring an additional fee. Members must be prepared to show a current Riverbanks membership card, new travel passport* and a picture ID. It is highly recommended that you contact the institution you plan to visit ahead of time to verify reciprocity and to review the specific admission/membership policies, parking fees, guest privileges and discounts to that facility. Riverbanks memberships make great gifts! eGift membership vouchers may be purchased online and redeemed on your gift recipient’s first visit to Riverbanks Zoo and Garden. Plus, you can wrap and hand-deliver the eGift! Gift memberships may also be obtained at any Riverbanks ticket booth or submitted by mail and will start on the date of purchase. To purchase or renew a Gift of Membership: Purchase an eGift membership voucher online or download a printable mail-in form(PDF). Questions? Call the Membership Office at 803.779.8717 (and press “1”) between 8:30am and 5:00pm, Monday through Friday.